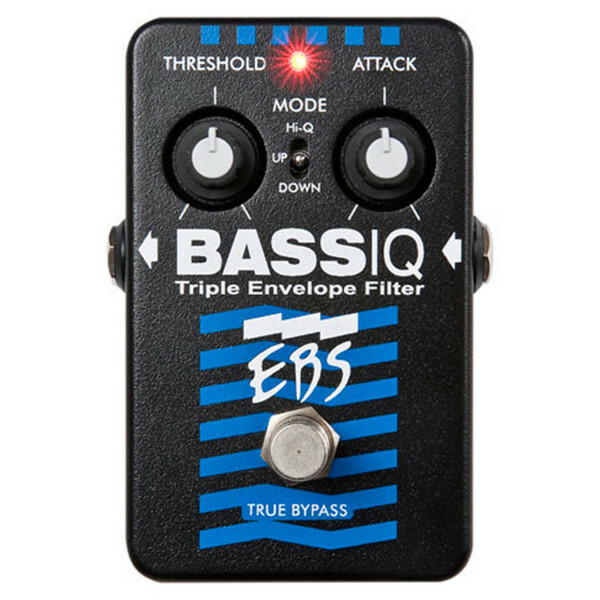 Get funky and amazingly responsive sound in a stomp box with the EBS BassIQ. This analog envelope filter pedal is triggered by the notes you play. You can get sounds ranging from the classic auto-wah to space-bass or "Funkadelic" sound. The EBS BassIQ boasts controls for threshold and attack, and has three different modes, Hi-Q, Up and Down. The 2008 edition uses true bypass technique. This new edition of the BassIQ boasts several improvements: It has 3 dB higher headroom, it boasts higher sensitivity - easier to dial-in, it has new analog circuitry with higher dynamics and lower noise and it has mechanical True Bypass switching.